No matter what, Caleb Gindl wasn't going to leave the bat on his shoulder. That much, he knew. The Brewers prospect had tripled and homered in the first three innings Sunday, then doubled in the eighth. So when he came to bat in the ninth, he'd need one pitch. Gindl completed Nashville's first cycle in seven years -- and third in its 33-year history -- with a two-out single to center field in the Sounds' 9-5 road win over the Albuquerque Isotopes. "When I came up, I was like, 'Go down here swinging,'" he said. "There was no way I was going to walk." Playing right field and batting seventh spot, Gindl became the first member of the Sounds to accomplish the feat since J.R. House on May 21, 2004 against Sacramento. Tike Redman hit for the first cycle in Nashville history on June 30, 2001. Gindl also totaled 10 bases the hard way -- against four different pitchers. "I was seeing the ball well," he deadpanned. "I knew I probably wouldn't see one of the guys twice." The 23-year-old grounded out in the fifth inning in his second matchup with Ramon Troncoso, the same reliever he took yard in the third. The Florida native was due to bat fourth in the ninth and, thanks to Taylor Green drawing a walk and Wil Nieves beating out a potential double-play ball (the catcher already had grounded into two), returned to the batter's box for one shot. "It was in the back of my mind," Gindl said. "As soon as I hit the double [in the eighth], it registered. I was just like, 'Man, I hope I get up one more time. "It would have never happened if my teammates didn't get me back up; they battled." What was Gindl's on-field reaction? "I gave a fist-pump," he said. The achievement caps a torrid two weeks. He's batting .393 (22-for-56) over his past 13 games and has raised his average 29 points to .281. "I just tried to make an adjustment," said Gindl, who had four multi-strikeout games in the season's first 11 contests. "Early on, I struggled with off-speed pitches. I just had to be more selective, swing at strikes and not swing at everything. That's been the biggest difference for me. Before, I was swinging at a lot of bad pitches." Gindl, Milwaukee's fifth-round Draft pick in 2007, is in the midst of his first Triple-A trial. He batted .217 in April, .240 in May, .303 in June and sports a .364 mark this month. "I have been getting better each month," he said. "After the season, if I can look back and see I got better, that's the goal right now." 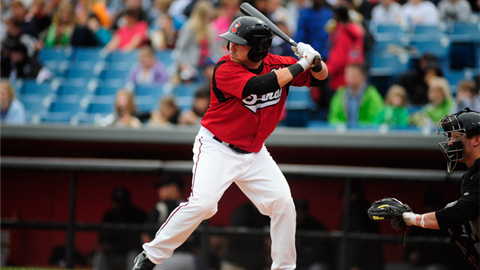 Green also starred for the Sounds, reaching base four times and smacking a third-inning grand slam that preceded Gindl's own longball. Green went deep against former big leaguer Ian Snell (1-2), who was charged with six runs over two-plus innings. Nashville starter Josh Butler (5-5) allowed a run on five hits over five innings, but the Isotopes pushed across four runs over the final two innings. Dee Gordon, the Dodgers' No. 1 prospect, tripled and singled twice in five at-bats for Albuquerque.